Watercolour showing mill and surrounding buildings. Titled: 'The Darnley Mill'. 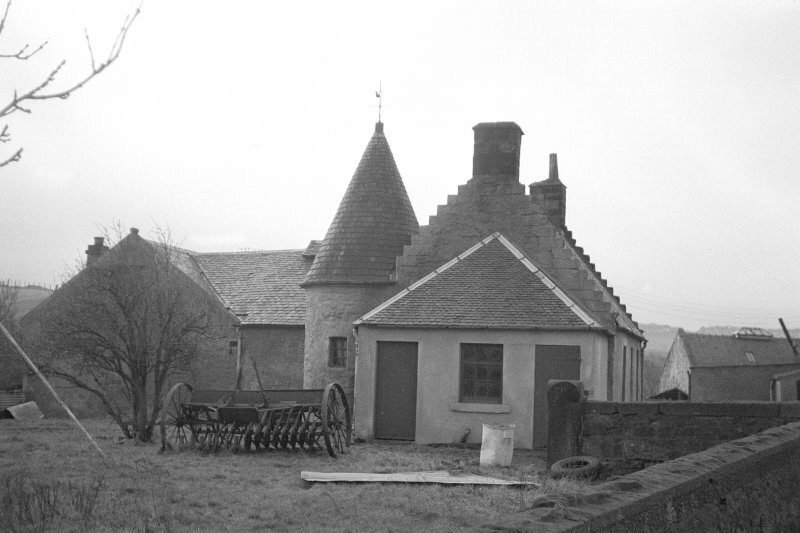 Scots Renaissance, crowstepped group of much-altered cottages, with conical- roofed circular north-east tower, for Stewarts of Darnley. Extended and incorporated in restaurant, c.1999. Part of the mill is a small building with crowstep gables and a small turret at the NE angle. An illustration of this building appears in Charles Taylor's The Levern Delineated, 1831. NS 5290 5955 (NMRS NS55NW 31) A field evaluation involving a desk-based assessment, standing building survey and limited excavation was undertaken by Glasgow University Archaeological Research Division, in advance of the proposed development of the existing buildings on the site. 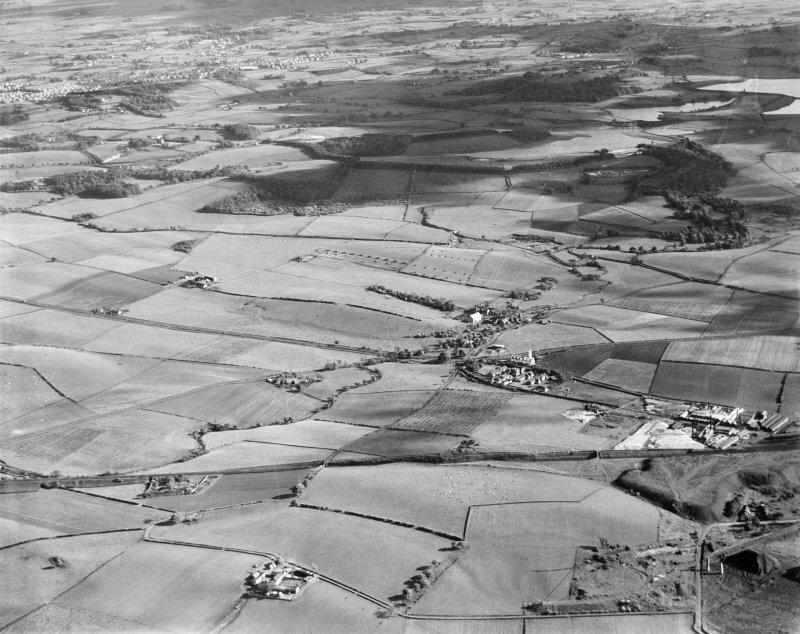 The assessment was carried out in order to shed further light on the historical importance of the two remaining standing buildings on the site, and to assess the general preservation of any adjacent buried archaeological remains within an area known to consist of large areas of made ground. Documentary evidence hinted strongly at the possibility of the cottage being the rebuilt and redesigned remains of a tower house of unknown date (possibly Darnley Castle). On the same basis, the mill site had the potential to date to the 16th century. The structural survey, supplemented by limited excavations within and around the cottage revealed that it had undergone a slow and complicated metamorphosis. The existence of a stair turret and blocked upper windows suggested that a structure of more than one storey existed on the site, although not as a primary structure. The remains of a reversed entrance pointed to an early, if not original, substantial feature, containing a certain degree of architectural quality, as did the half-glazed windows in the S gable. 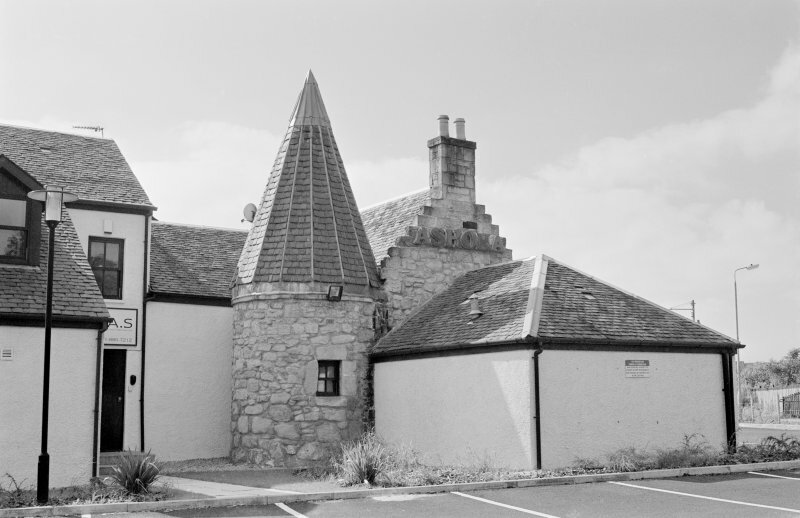 However, the foundations examined are considered too slight to be the reused foundations for a typical Scottish tower house. There were no securely stratified finds which could be shown to have remained in situ. The constant reshaping of the site suggests that all contexts are likely to be disturbed to some extent. The finds retrieved, did, however, allow a broad chronology for the site to be arrived at, putting it firmly in the post-medieval period. The type and quality of these artefacts is generally ?everyday? and implies no great social status. 15th-16th century	A building to the E of the present cottage, on the axis of the E wall. 16th-17th century	A building on the present site, possibly extended to the N.
18th century	A building of the same plan and form as the present-day cottage with a stone floor and 'walk-through' windows with a door on the W side. A door on the E side is possibly still in use. 19th-20th century	A building with partly blocked windows and a door on the W side with a raised, internal wooden floor. Due to health and safety considerations, very little excavation was possible in order to establish the earliest origins of the mill. A phasing sequence of the upstanding building based on the standing building survey is as follows. Phase 1	A low, probably one storey, sloping-roofed building, c 5m high, with an entrance in the N gable end wall, a window at ground level in the W wall, a window and entrance in the S gable end wall, with a water wheel house at the S end. Phase 2	The heightening of the walls by c 2-2.5m to create a two storey building. The insertion of a doorway and window on the W side, an upper storey window on the E side and an entrance at the N end. At this time, the lower entrance was blocked and the ground level to the N of the building substantially raised. Phase 3	Blocking of the upper storey window on the E side and the addition of a large barn butting onto the mill. Phase 4	The rebuilding of the upper storey floor level. Sponsor:	City of Glasgow Architecture & Related Services Department. The building at Darnley Mill appears to be that described in Crawford's account of the Stewarts and in Taylor's The Levern Delineated, as the reputed "abode of the Earl of Lennox, at Darnley Toll Bar", presumably a late residence of the Stewarts of Darnley, before they sold out to the Earl of Moray. Taylor's sketch shows the corner turret part concealed by thatch. It was originally two storeys high, but reduced c.1815: it had the inscription on a window DS IS DS 1614. On Roy's map this is the position of Darnley. There is now a housing estate immediately west, and north of the A726 are high rise flats. Information from Mr T Welsh, 1983.